Introduction: The use of composites in civil structural applications. Part 1 Aspects of composite durability: Fabrication, quality and service life issues for composites in civil engineering; Durability of composites in aqueous environments; Durability of composites in freeze-thaw conditions; Durability of composites exposed to ultraviolet radiation; Durability of composites exposed to elevated temperature and fire; Durability of composites under fatigue loads; Creep and time-dependent response of composites; Durability of composites due to wear and erosion. Part 2 Applications and monitoring of composites in civil engineering: Fibre-reinforced polymer composite structures and structural component; Current applications and durability issues; Reinforcement of concrete using fibre-reinforced polymer composites; External strengthening of structures using fibre-reinforced polymer composites; Rehabilitation of concrete structures using fibre-reinforced polymer composites: Identifying potential defects; Structural health monitoring and field evaluation of composite durability. Given the increasing use of fibre-reinforced polymer (FRP) composites in structural civil engineering, there is a vital need for critical information related to the overall durability and performance of these new materials under harsh and changing conditions. Durability of composites for civil and structural applications provides a thorough overview of key aspects of the durability of FRP composites for designers and practising engineers. Part one discusses general aspects of composite durability. Chapters examine mechanisms of degradation such as moisture, aqueous solutions, UV radiation, temperature, fatigue and wear. Part two then discusses ways of using FRP composites, including strengthening and rehabilitating existing structures with FRP composites, and monitoring techniques such as structural health monitoring. 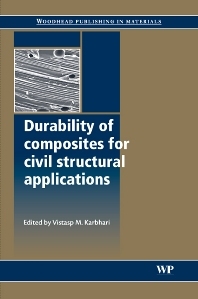 Durability of composites for civil and structural applications provides practising engineers, decision makers and students with a useful and fundamental guide to the use of FRP composites within civil and structural engineering. Vistasp M. Karbhari is President of the University of Texas at Arlington, USA. Professor Karbhari has an international reputation for his research on the use of composites in civil engineering.